I am already at work on another revision of this one after seeing how it rendered with first draft but figured I would go ahead and post the initial work right out of the oven no post work. 4) Fix DoF which I forgot to change after adding the dragon so that he would be in focus. I would love any DoF tricks you guys have learned. I notice that I do not consistently get a strong DoF effect. I did not think that Daz tone mapping effect for F/Stop affected the DoF strength like it would in a real world camera (Not sure if I read that somewhere or made it up) but if that is the secret and someone can confirm please let me know. 5) I would like to add steam around the surface of the pool table where the lava/fire is hitting to create an atmospheric effect within daz so it is not needed for post work. I welcome any pointers or links for this effect as I would really love to know how to make it without having to purchase the premade effect. This is just my initial list after seeing the image right out of render. I welcome any critique/suggestions for this. Models: Mackenzie G8F wearing Hongyu's Bikini with a preset shader and Orphelia_Hair. DAZ Dragon 3 with default available mats and poses. Props: Glassware Collection for Iray Vol. 2 (Tasty beverage under Mackenzie's hand holding the pool stick). I used Liquid Pack for the lava/flame for the Dragon and one of the presets for blood to scale and set the lava/flame initially and then applied an emissive to it for the effect. I tried to tweak it to get it looking better but still feel it is lacking considerably. For point 5, I know you said you don't want to purchase it, but if it comes to that, I think Sickleyield just released a product called Fast Iray Steam (or something similar) in today's sale. Man, this scene took ages to render, like 2 and a half hours (really testing the limits of how many G3 figures my pc can handle in one scene). Lots of pokethrough and stuff to fix, and the lighting needs work, but I'm reasonably happy with the posing and camera angle. Here is my updated version of Lady and the Dragon. I fixed the composition to where it was more symmetrical and pleasing to my eyes. I no longer feel the overwhelming shift to the left nor get distracted by the pool table lines being askew. I introduced another issue, however, with the hair line. I turned its opacity up to 2 and with this hair it seems to make a chunk/stripe of hair colored material band across the forehead where it meets. I am not sure if this is fixable by adjusting the hair on the model or if I simply have to turn the cutout opacity back to 1. I could easily fix in PS but am wanting to not use post work on the image. I will address other comments in separate reply's to keep the entry images more uniform. Thanks for the feedback and link Linwelly! I tried using the opacity like you had mentioned and did not get a result that I was happy with, unfortunately. I will keep researching to try and find what I need to do for that. I remember reading somewhere about LIE's but have not used them yet. Thanks for mentioning them as that gives me another tool and something to look up. I saw the new fog that is available for purchase and I am totally for purchasing it and think it is absolutely worthwhile to do so, however, I know that many of these products are made using techniques that users can replicate should they have the know how. I am all for supporting content creators but also want to learn how to do alot of these things myself and am not afraid to put in the research time. Often, already, I have found out many things just from the items that I have already purchased about how they are achieved and that helps tremendously being able to pick apart the settings. I am going to check out the post you linked for the 3Delight version and see what I can come up with. It looks like the pool table is one big poly as the deformer tool would not work on the small section I targeted. I am curious if I am able to introduce more polys and even replicate the top plane of the pool table in order to get the extra polys. I love this idea very cool! 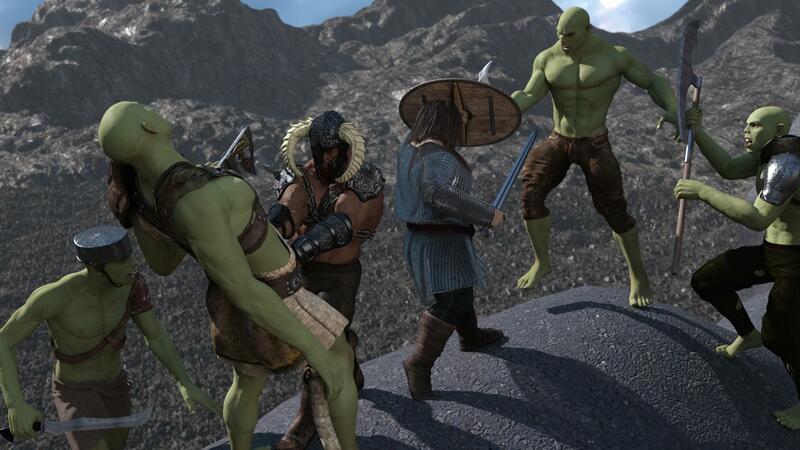 What strikes me first is the orc in the bottom left that is looking past his homie with the axe in his chest, or it looks that way, to the standoff at the far side of the image. It would be cool to seem him in a fit of rage at the human close to him that just stuck an axe in his homies chest! I think that the scene is definately very populated and I believe that offers a good chance to keep the viewers eyes moving if you create the right dynamic and intensity across the entire scene if it all is going to remain in focus. I think the farthest orc staring down the human with shield raised looks very calm. While he may not yet see the axe in his buddy's chest, cause of the raised shield, he is still in a heated battle I imagine and a big powerful pose like sword overhead about to bash the shield or something likewise would help the overall feeling and momentum of the scene. The first thing my eye is drawn too is the tall orc in back and then immediately to the human going all Kingsman with his axe and it feels like two totally separate dynamics. I love the shadows in the scene and think you have a great position for the dome light in respect to the characters. I also think the placement of the characters is done well and keeps intrest without making the scene too busy. I have added some more story elements to the scene in this revision (3). I am still not happy with the DoF, as I want the new figure on camera right to be more blurred but still noticeable so will re-render with that change in future revision. I just used one of the presets and applied an emissive shader to it colored resized and tweaked it from there. I also applied an emissive to the que ball and colored it just to make it look like it is heating up. I tried a range of cutout opacities to achieve different results but I think that what I am wanting may only be achievable by building up multiple instances of the node for that object and build up the effect with different colors/cutoutopacity/lumens on top of each other. Ment to post this after work yesterday, but here's my start. After struggling with many fails and endless render times over 15h here is my momentary result. I have that one, though it seems I used a different prop and followed your initial steps, here is what I came up with, settings on the side, what you dont see is translucency weith to 0.89, color to a yelloworange, and backscattering wirght dialed up as well. Awesome! Very cool and thank you for that info!! I am going to try combining principles from your smoke info and this and layer up the effect to see what I can come up with. I have been fighting and fighting with a way to do dark renders with little render time and think I finally have combined may different techniques and tutorials in order to produce just what you are wanting. It does involve a little work in photoshop though. I will try to get something put together that makes sense and post it here but not sure how long that will take to finalize. I am also wanting to verify in different scenerios that it works consistently. For a short version though I am basically rendering each light using Canvases in its own separate canvas and also pushing the lights up a good bit brighter than what I am wanting. The finished .exr files are then pulled into photoshop and there is a way to get them setup so that you can then adjust the brightness of each light effect individually. One room that always had fireflies and noise even after hours of rendering is able to be rendered in 30 min using this technique. the shape of the ornimantes in closeup have straight edges. I might need a few more decorations on the walls. Awesome scene! What did you use for the background outside the window? Yes, I used both Bloom and DOF. I wanted it in this way. Thanks! I still laugh every time I look at the scene. The outside backdrop is from "Redhouse Christmas Carol" and some of the decorations are from "Redhouse Sweet Shoppe". 2.) Make use the shutter time, f/stop, ISO film triangle. in this case. I would raise the f/stop or the shutter time. Maybe both. This is good advice, than I would as well reduce the light intensity of the building on the right, I understand you want to give the silhouette a bright frame but I have the feeling this is a bit much. Love what you have here so far. I hope you don't mind, but after this month is over I just might send the end result of this to my mother, I think that she'll love it like I do. Thank-you. I woudl be pleased if you sent it to your Mom. That is the biggest compliment, thank you-again. ... The finished .exr files are then pulled into photoshop and there is a way to get them setup so that you can then adjust the brightness of each light effect individually. One room that always had fireflies and noise even after hours of rendering is able to be rendered in 30 min using this technique. Do you know of any other way to open the .exr files? I couldn't get the .exr plugin to open with my version of photoshop becuase it is an older version. I am not sure. Put what version/build of ps you have and I will try to find out. I have the OpenEXR plugin and Photoshop elements 10.That version of Photoshop is only a 32bit application and the OpenEXR plugin is 64bit, so they are not compatible. I havn't found any way to work with the .exr files yet. I am not sure if GIMP offers any plugin support for .exr's but there may be several alternatives out there for this. Ok, this is going to be a very rough example of me trying a similar scene and showing the results with .exr's after 10min of rendering. I am also attaching the .exr files for use and experimentation if you have a way to open them in photoshop. The video link I posted will show similar way to get the exr effects but I can also post a more thorough guide on that for PS later. One thing to note is that any tone mapping in daz does not carry over to the .exr so this involves some knowledge of how to use photo software. I understand this may be seen as convoluted and beyond the scope etc but for quick renders this beats anything else I have tried and I am only sharing what works for me. I too wish there was a way to get awesome renders at sub 30min marks out of daz but with things I like to setup that doesnt seem possible. Plus, this technique allows me to come back and tweak the result anytime without re-rendering. I let the scene render for 10min and forgot that the tone mapping should actually be off while rendering with canvases but I had set mine up with bloom, dof, firefly filter, noise filter etc and only let it run for 10min with over a 100 iterations, probably would have double or more iterations in same time with mapping off. After render pulled exr's into PS and now able to tweak as I want. I am not able to attach the .exr's here as is so I will have to upload them somewhere for use or change the ext from .exr to .jpg then you would need to change back to .exr to use them but I will do that in a separate post. Remember all this was done within daz and PS total in under 20min. It took longer to make and edit this post than to get this result and while noisy a half hour or 1hr render would certainly provide excellent results vs half day or full day render times in daz.